I first came across this promotion shared by a financial blogger. This promotion was actually on the bank's page for quite awhile. I was excited. Like any typical Singaporean, I love freebies. Let's be realistic here. It's not some goodie bag, but actual cash. Sounds too good to be true? In this case, it is. The requirements are so simple. If you already have existing savings that you won't need for 6 months, you can just open it. I decided to open the eMSA account. Sharing is caring. So I shared this with my friends. Mehh, it's only $20, the money dries up in one to two days anyway. But if we paid more attention to it? Huge thanks to fellow blogger Foolishchamelon and a reader who contributed the return in percentage terms. It is a 2.2% p.a return for $1800 at the end of 6 months! So I tried to put it across to my friends. I don't get anything from this, so why try? Pretty much inspired by other bloggers, I think I can do more with financial literacy along with others. 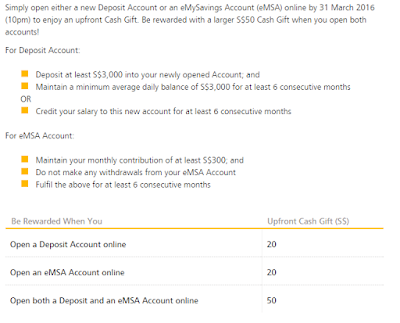 No banks normal savings account offer this much of a return. POSB eSavings is only 0.05% p.a. I shared the promotion for opening CIMB FastSaver(Link) back then as well. I received $10, which was some 1.7% for $1000. There's no promotion now. I shared the promotion for opening CIMB FastSaver back then as well. I got $10, which was some 1.7% for $1000. I have to work 3h part-time just for $30. Click a couple of buttons, and I have that $30. For so little effort? It's a no-brainer for me! I opened it.